Good news to all the OFW, a new web based app has been recently launch aiming to help OFW. This provides first aid info, basic tutorial on certain languages, as well as information on how to avoid fake recruiters. 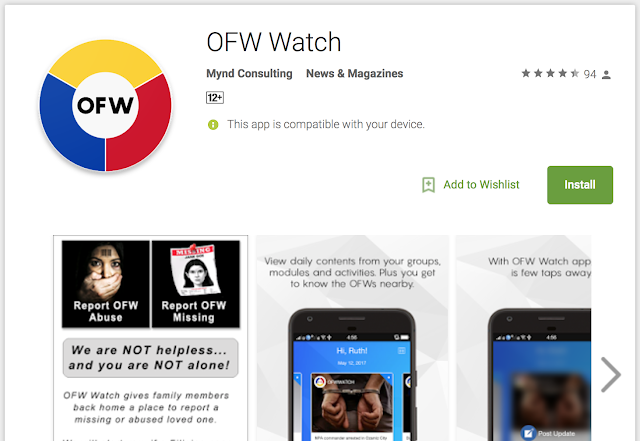 The Overseas Workers Welfare Administration (OWWA) urges every Overseas Filipino workers (OFWs) and their families to download the OFW Watch app. This mobile app also enables to connect with OFWs in distress, especially those calling for help, anywhere in the world, anytime of the day, via mobile. “It is a one click process of asking ‘help’, data sharing, and other means of internet applications made easy via mobile phones,” OWWA Administrator Hans Leo Cacdac said. “The OFW Watch immensely contributed change to the mindset of our `kababayans’ working abroad that they have somebody by their side at all times,” he added. The brains behind the successful Android mobile phone application service intended for OFW community is a former OFW, Myrna Padilla. You can download the OFW Watch app from the Google PlayStore. 15 MOST DOWNLOADED AND THE BEST VIDEO CALLING APP ... - These are the 2016 best free video calling app, the best free phone video chat app, where you can make a free face-to-face video call, as well as online messaging and online texting for free. WhatsApp Calling and Video App Now Totally Free and Available in ... - WhatsApp is available for free as a calling and video app with text and image support for iPhone, Android, Nokia Symbian S60 & S40, BlackBerry and Windows Phone. Internet Voice and Video Calling Apps Is Now Unblocked in Saudi ... - It was about four years ago when the Saudi government started blocking messaging, voice and video calling apps from the country. SEND FREE TEXT AND FREE SMS USING CHIKKA, STC APP ... - This three free send an sms ideas for overseas Filipinos and to anyone overseas will give you not just savings by sending free sms using web, or send free sms using app but will also enhance relationship as we constantly communicate with our loveones.